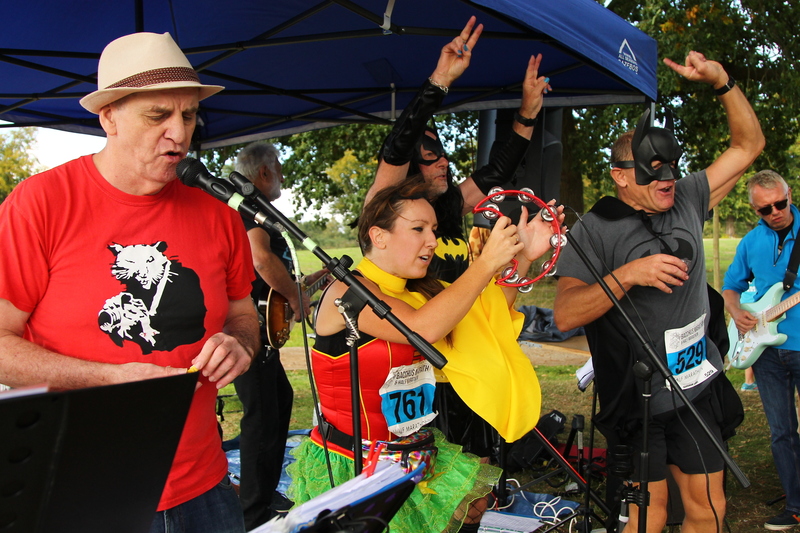 Whoever suggested that running and drink don't mix, has never run the Bacchus. 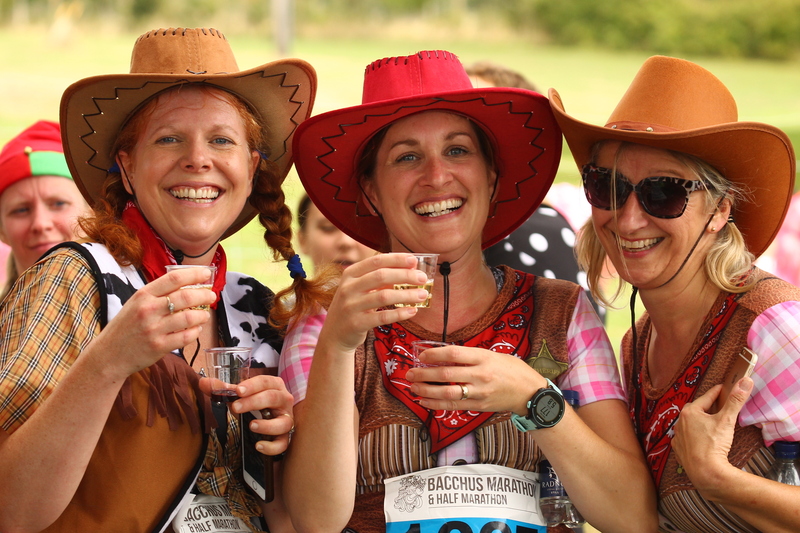 With five wine stations to visit on each lap and six wines to sample, the Bacchus races are definitely events to take your time over. The main events are timed but few runners worry too much about the speed they cover the distance in. That said we insist that those signing up for the marathon need to be capable of running the distance in under five hours - there is a two-hour-forty-minute cut-off on the first lap for those going out a second time to complete the marathon - which still leaves plenty of time to enjoy the wine, food and entertainment along the way. Each of the sampling stations will have a different wine to taste, all of them grown and produced on site at Denbies. The last station is s double station and will have two wines to sample. The wines will be a mix of reds and whites and will showcase some of Denbies award-winning English wines including one of the sparkling wines on which the vineyard has forged its formidable reputation. We should emphasise that they are tasting samples and we would ask that you take only one glass per station to ensure that everyone has the chance to try the wines. There will be a wine marshal at each station who will be responsible for dispensing and controlling the distribution of the wine. You'll be able to able to enjoy a further complimentary glass or wine or beer or soft drink at the finish with the hog roast. Additional drinks will be available to purchase. 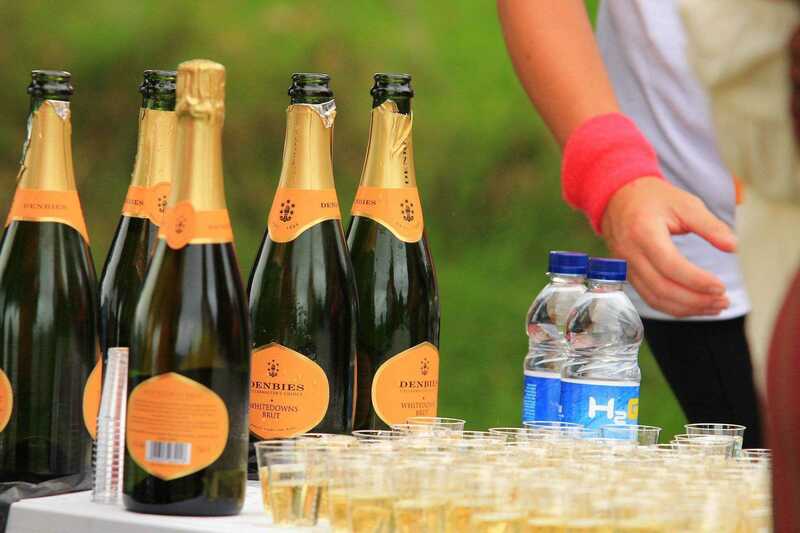 As well as the wine, we will have water available at all of the drinks stations and the finish withHigh5 energy drink at one other drinks station. To accompany the wine, we will be serving small food snacks at four of the drinks stations. The other station, which will be around nine miles, will be designated as an 'energy' station. Although it will still be serving wine, it will also have High5 energy bars and gels. Don't forget that in addition to the food and drink, there will be some form of musical entertainment at each drinks station. Last year that was a mix of local cover bands, a choir and a Scottish Piper. That was in addition to the DJ at the start/finish area who keep the party going at the post-race hog roast long into the evening.